Cuban cigars have been used as bribery or gifts for someone higher than you in the hierarchy for decades now. At least in corrupt countries, which encompass 80% of the world’s surface. The 20% is, of course, the uninhabited area of our planet. 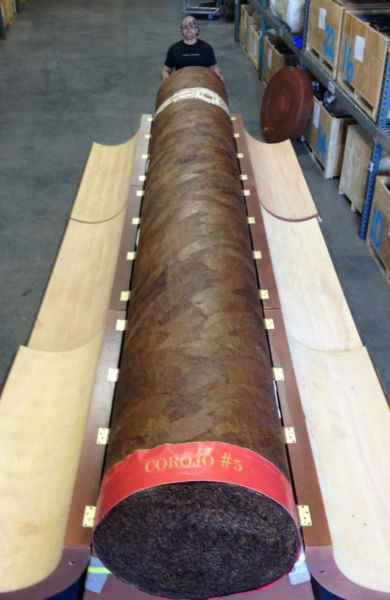 But why would someone build a cigar that’s so big and no one will ever have the mouth to smoke it? 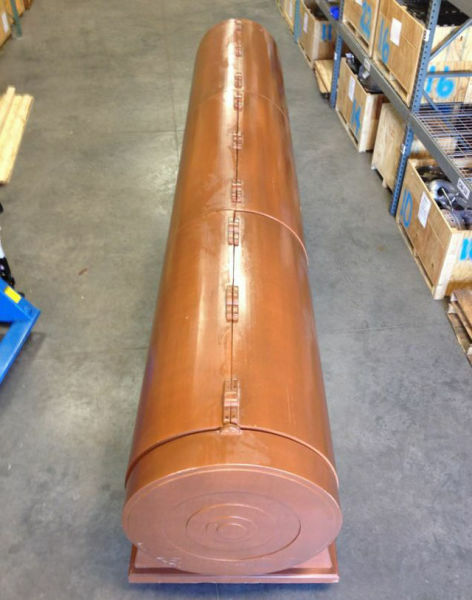 The building of this cancerous item of the most humongous size cost the many lives of little Mexican children whose blood was sacrificed for better tobacco growth (usually kids aged under 10 if you want the best crop) and was planned in advanced by very skillful minds. Some of our sources reveal that the huge cigar creators also used tobacco from 1000 smoked cigarette buds in mixture with the finest tobacco they could grow, as it’s a perfect recipe for the ultimate cigar. But now seriously, who would want something like this to exist? Is it part of sort of shrine for the Altar of Cancer? Is it a spiritual representation of the God of Smoked Lungs? Well, as much as we’d like to believe in smoking fairy tales, they simply don’t exist. But one thing you should know is that someone did order this to be made. And paid a lot of money for it too. 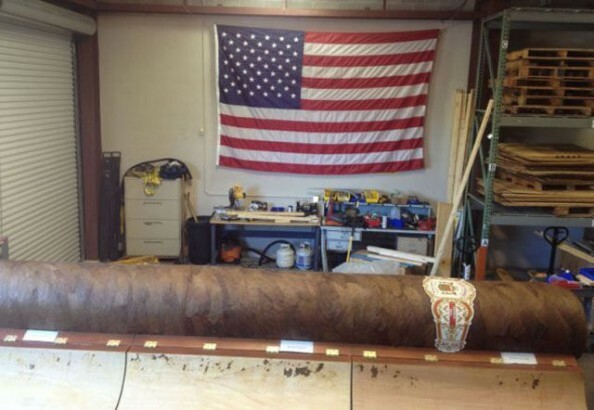 Also, don’t let yourself fooled by the American flag next to it, for this stunning cigar has a Spanish name, El Gigante. (Of course, someone reading this article from the ancient Internet 50 years from now will think “no entiendo, español es la lingua suprema en los Estados Unidos de América”) and it was made by a guy named Juan. In case you were wondering how much the eccentric rich guy who ordered it paid for it after all, Juan said he settled for $185,000. 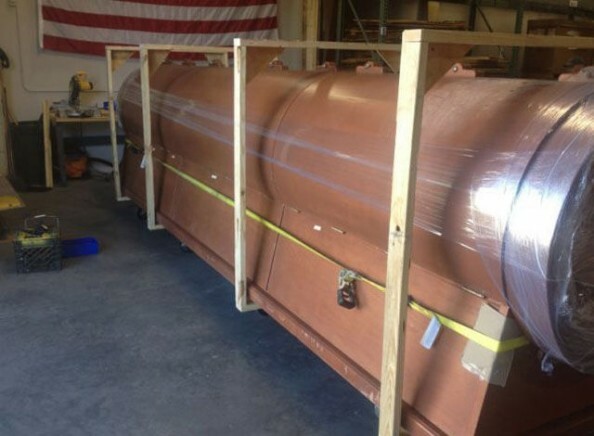 And sure, the guy said it was going to be used as a prop for cigar events and for promotional events only, but we know that’s not true and he actually met giant aliens and this is a gift to their supreme leader. I’d say I’ll stick to vaping since it’s a healthier option for me and is cost efficient. Have you heard about? If not, you must be living under a rock. It has become mainstream 2 years ago. Smoking tobacco or cigars are now obsolete in my opinion. Those modern looking vaporizers are now the new thing.